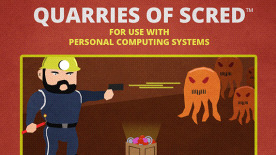 Welcome to the Quarries of Scred. You will surely perish. You’ll question your sanity as you dive deeper into the quarry, hoping to return with a larger reward. And with each map being procedurally generated, you’ll never know what the next quarry will throw at you. Bob’s going to die. A lot. It’s inevitable. However before he does, you get to choose how he risks his life. Should Bob take the land mines, the lasers, his gravity inverter or some other sweet power up? Have we mentioned that Bob’s going to die? Don’t let that stop you. Come into the quarry, pick up a few gems and get your reward. It’s easy! Now try a little more. And more. And more. Oh look, your greed killed Bob. When Bob inevitably dies, don’t stress. He’ll pop right back up, ready to go down into the Quarry again. And because each quarry is procedurally generated, he’ll think it’s a brand new challenge. Which it is. Sort of.